Megan Racing Spoiler -Type-R - Dezod Motorsports Inc - Home of the automotive performance enthusiast since 2002. 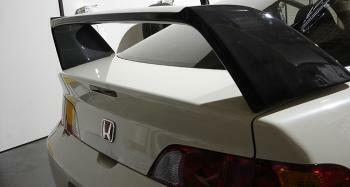 JDM Type R style spoiler. 100% real carbon fiber spoiler for Integra 94-01, carbon fiber is with UV protected, able to last a very long time. This spoiler will also fit 94-97 Accord 2/4dr. For the Honda enthusiast seeking that perfect finishing touch to their JDM Honda Integra Type-R Megan Racing now offers a REAL Carbon Fiber replica of the JDM Type-R Spoiler. With both style and function, this carbon fiber piece is a direct bolt-on and features extremely light weight construction and UV Protected Carbon Fiber. With strength and durability a key feature, your car will feature this timeless piece as the perfect finishing touch to your JDM ITR Project.